Marathon Petroleum Company (MPC,$66.25) is down $1.20 today, and has an option that expires in 60 days on April 20, 2018. That’s a great set-up for a trade that has been a winner 93% of the time over the last 2 years. Enter a “Short Put Spread” using the 60-day option. Sell short the 30-Delta put and buy long the 10-delta put. That is, short the $62.50 put and buy the $57.50 put, using the April 20, 2018 options. Wishing you peace, prosperity and good hedging! UPDATE April 17th: With 4 days until Feb’s roll to the April 20th put spread expires, it is time to take profits. TXN has rallied to our $105 strike price on the short April puts. There’s no need to hang around in markets this volatile. Buy back the short $105 puts, which are at $1.00 asked at the moment. Our initial Feb $107-$101 short put spread was entered for a credit of $1.02. We rolled that to the April 20th $105-$95 short put spread at a credit of $2.90/spread. Buy back the $105 puts at today’s $1.00, and that’s net $2.92/spread on a risk of $6.08 ($10-3.92) or 48% gain in 3 months. Happy Trading! You can scroll through the other trades at the bottom of the Linked In page. is a noun that is the female version of a male’s “virility”. Her muliebrity is celebrated far and wide. Muliebrity would connote “softness”, perhaps not of spirit but certainly of physicality. Would this word be decried by hard-line feminists? Inquiring minds want to know! I’ve traded stocks for forty years from various countries around the world. The stock exchange in Addis Ababa was a chalk board in a local bank, open a couple hours on weekdays. Spokane was dedicated to penny mining stocks. I traded currencies sitting atop burlap sacks of wheat in Kabul’s old granary. Now we’ve got super-fast online algos and battalions of talking heads promoting their own interests. But no matter. Some things I’ve learned cut through the hype. I hope they help you if trades are going wrong. 1. A trade is neither right nor wrong. A trade can only be profitable or not profitable. b) Unprofitable is bad. Do something! a) Brag about your losers, not your winners. Tell everybody about losses. Get on the phone! Tweet! b) For a losing trade the only thing to brag about is how small you kept the loss, how quickly you stopped the bleeding. c) Your Ego must understand that you’re going to tell everybody about every loss. d) Bragging about losers will develop an inner voice urging you to get out. It will replace the voice keeping you in losing trades. trading stake down to zero. 4. Every trade has two aspects, time and market direction. a) for every trade, know your time frame. b) for every time frame, determine market direction. the market going in the direction of your trade. e) at the end of the time frame, recalculate. Are your assumptions still correct? What’s your new time frame? Why are you still in the trade? for a loss to brag about? Return to #2.
traders who have the advantage of being on the floor. a) The PhD.s are smarter than you. master hunters of pre-historic times. c) Your computer is no match for the competing computers. every trade. How fast can you get through it? Practice! the market”, that the market will go where you say, then put your money in T-Bills and take a long vacation. Motorcyclists who stay afraid of their machines die of old age. Those who think they’re Evel Knieval die terrible deaths. Know your machine before you drive it, and stay alert. Freight trains do come roaring across unmarked crossings. reasonable. The sharks can’t take what’s not on the table. trading and take a walk on the beach. 9. As options expiration approaches, the Grand Croupier will sweep the table in all directions. You’re not the croupier. In the last week, never keep an expiring short position that’s within reach of the croupier’s stick. Time and an approaching expiration let the croupier take control of an open short. It’s asking for great pain. 10. Getting market direction right is only the first step of a trade. These are a few thoughts that I’ve found helpful. I hope they help you, too. Please feel free to share them. Wishing you peace, prosperity and good trading – Karl. After the market closes, I hope you’ll relax with a copy of my novel, “A Lesion of Dissent”. It’s available on both Amazon.com and Smashwords.com at the links below. I stood by a painted post on a gravel highway. Chill autumn wind was blowing through sparse sagebrush on the darkening Baluchi plains and I did not know what to do. Westward, the milk-train bus I’d ridden all day was retreating back into Iran. East of the post lay Afghanistan, its nearest city, Herat, miles away through the fast-falling night. Several other backpackers from various Western nations also stood near that post, the final passengers to exit the bus that we’d boarded early that morning in Meshad. In 1968, no one but adventurers went overland to Afghanistan. The border was the post, the post was the border, our transport was gone. We faced away from the disappearing bus, marooned, staring in the direction we thought must lead to Herat. Very gradually, some dim lights appeared, and slowly grew bolder, though hardly brighter. 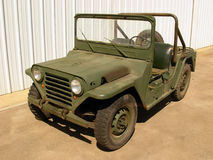 We watched until a World War II surplus army jeep pulled up, an Afghan at the wheel. We quickly established that we had no common language. “Herat,” we said and pointed. “Herat,” he said and pointed. We fumbled our way to a price for transport, handed over some money, and piled into the jeep, crowded together, backpacks on our knees. And then out of the dark, another Afghan appeared, clutching a long Browning rifle, the weapon the Allies issued their infantry in WW II. The driver motioned for us to make room, and Rifleman crowded in, a big man right next to me in the front seat, squeezing me over against the driver, and we began a slow crawl along the rutted highway into the eastern night, the limpid six-volt headlights swallowed by the ebony deepness of the surrounding black. A mile passed as the driver picked our way through ruts and chuckholes, and another mile and more, a monotonous, jarring journey with no glimpse of Herat yet on the horizon. Of a sudden, we were each aware that we were no longer on the highway. The jeep was bouncing across undulated mounds, sagebrush swishing by the open sides. We talked at the driver in various languages, asking why we’d left the highway, entreating him to return, trepidation rising as we bounced deeper into trackless desert. Beside me, Rifleman loomed large in the very faint glow of a few dashboard gauges. “Oh, god, this is it,” one of the travelers behind me said. I knew what he meant. At best, we would be robbed and left bereft in the desert, at worst, murdered as well. A mile or so seemed to pass, and as the jeep topped a mound, an earthen structure materialized, shaped somewhat like a quonset hut. The blank end of the building threw back enough headlight to define it from the swallowing darkness all around. The driver sounded his horn, and soon, a dazzling white light flooded out from the center of the hut, a door opening and letting out the brilliant white glow of hissing pressure lanterns. The jeep stopped a few feet from the door. Rifleman jumped out, then motioned us towards the hut. The driver was talking and pushing on my shoulder, saying something none of us could understand. First out of the jeep, I was also first into the hut. I stepped through the door, squinting at the bright pressure lanterns hung from the low, rounded roof, facing a long trestle-type table, and then I froze, the traveler entering behind bumping me forward. Grouped at the table were six tall men in Gestapo uniforms: black-wooled, ribboned and medaled, epauletted, leather-belted, weapons-holstered Nazi storm troopers. Only they weren’t German. They were bearded Afghans. The other travelers pushed in around me as I gawked. They too, stopped and stared. The Gestapo stood behind the table, erect, strict, staring back. One of our group said something in German, and one of the Gestapo said something back, not in German. We sifted through languages and finally found some commonality in elementary Turkish. The jeep driver was motioning for us to sit at the long table as he shouted towards an Afghan at the far end of the room. We sat and laid passports out on the table, then breathed easier when the man the driver had shouted to came forward with a tray of glasses and a large pot of tea. I warmed my hands on the tea glass and tendered my passport down the table with those of the other travelers. And then a heaping platter of rice pilaf appeared and bowls and spoons, and while the Gestapo-draped guards thumbed our passports, we fell to eating. We ate, they stamped, and more tea was poured. Along one wall of the hut, a high shelf ran its length. 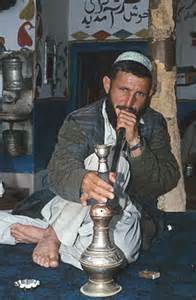 Spaced along the shelf were hookahs, the kind with the long hoses that pass around from smoker to smoker. Our driver spoke some more to the tea-man, and he fell to bringing water pipes to the table and lighting them. The Gestapo-guards watched as we made awkward attempts to draw on the water pipes, and laughed at our ineptitude. They spread among us as we shifted to make room, and gave us lessons in water-piping. At first we were smoking a sweet, rose-flavored tobacco, and as the guards began to congratulate us on getting the water pipes right, the smoke shifted to heavier mixtures, opium-laced hashish perhaps, but I do not know. Thus we drifted through endless glasses of tea, smoking, sipping, arm in arm with latter-day storm troopers. Gradually, their story emerged. Somewhere in Hitler’s mad march to power, he had decreed that Afghanistan was the true ancestral origin of the Aryan race. He reached out with foreign aid, supplying military training for the warlords that controlled the amalgamation of districts that was Afghanistan. The advisers he sent played dress up, supplying uniforms and attempting to transplant the goose-stepping Gestapo that was then terrorizing Germany. 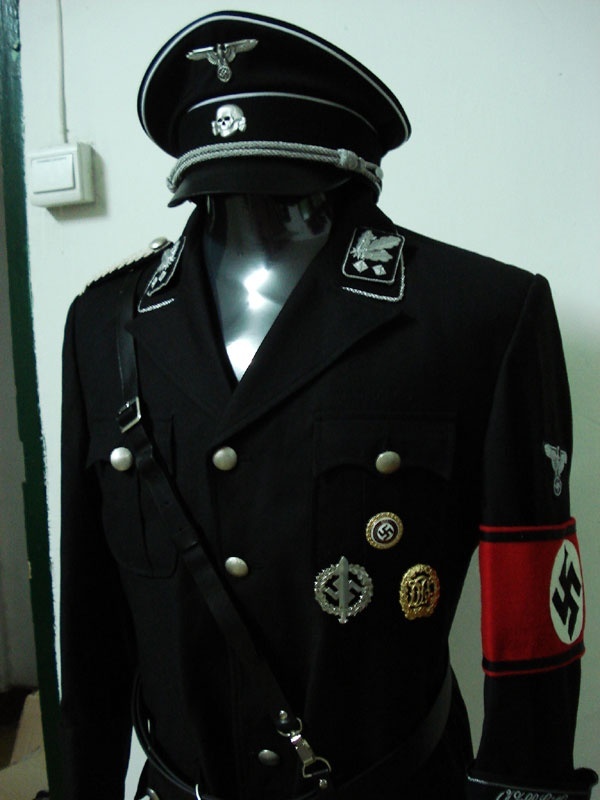 World War II came, and then it went, but good wool uniforms last a long time. Afghanistan, forgotten and at the end of the earth in those days, did what it always does. It carried on. The warlord of that western territory spanning the Herat road had inherited trunks filled with the Gestapo uniforms and liked the look, uncaring or perhaps uninformed of the stigma they carried elsewhere in the world. Over the decades since, I have spoken with many intrepid travelers who entered Afghanistan at that post on the Herat highway, but none has ever recalled a similar encounter with Nazi-clad patrols. It seems at times that it was a water-pipe dream, but it was not. It was Afghanistan, the end of the earth, where events were to get ever stranger as the years passed, as curious travelers became invading armies, and as I retired to my armchair to contemplate uncommon encounters in places far, far away. While you’re here, I hope you’ll take a moment to check out my novel set in the tumult of the 1960s. “A Lesion of Dissent” is available at either Amazon.com or Smashwords. com per the links below. Excerpts and scenes from "A Lesion of Dissent"
I Made $250,000 on the Internet Last Night, and You Can, Too!